You are going to find yourself in a places you would never want to be in reallity. Trust me. It all is just way too creepy and not in a funny way. The game developers have chosen one of the most perfect places for an eerie story to unfold. You play as a young woman who kind of lost her boyfriend. He went to investigate an old forgotten mental clinic, but it's been a week now since the last information was received from him. He told you that some strange things were happening here, but you didn't realized how true that was before you got to the place. You suffer from different hallucinations, some of which are not that unreal by the time you arrive to the clinic. You start from the outside area of the sanitarium exploring it all around. The place looks weird, sounds weird, and is weird. Here are a few things that you come across right from the start: a red liquid (blood?) coming out of the cracks in one of the walls; hands withough thumbs functioning as a lock on oen of teh doors; a little boy watching you and hiding from you; eyes (like real eyes) that you actually collect receiving a "well done" every time you do that; and, last but not least, your boyfriend held tied to something like a torture table suffering from pain. And all of that is only the start, you will get more of it when you get into the clinic. So if you are in the mood for a spooky story, this one will be perfect. The game does its best in every aspect to create this atmosphere. The graphics are done very well with some animated parts. The sounds and music are as gloomy. 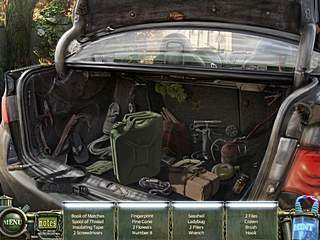 As to the gameplay, the fans of the interactive adventure and hidden object searches will love it. You are given a number of areas at each stage. So you go and explore each of them. One of them will have a hidden object search included. The rest are going to be full of many things to explore or collect or use to get something. Some of the things that you come across are of no use right at that moment, or most of the time you just have no idea how to unlock them or do anything with them. And some of the things which you collect stay in your inventory till you finally understand where you can use them. The game is not that easy in this respect. Sometimes it is quite challenging and difficult to figure out what to do or how to achieve what you need without additional hints. But isn't that what we look for in the games like this? There are also mini games in between the searches. They are quite interesting and fresh. I really liked them from the very first one, where you get a board of tiles with some holes. 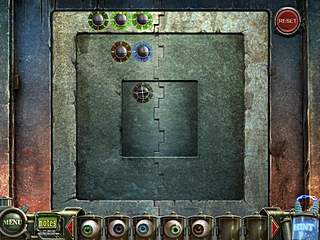 The task is to get the eyes all the way down by graging the lines of tiles horizontally, and allowing the eyes to fall into the holes. The game is perfect for Halloween time being so spine-chilling. 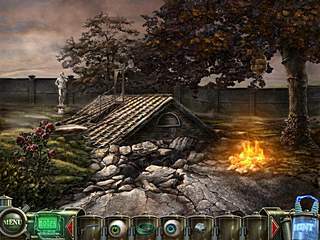 This is Haunted Halls: Green Hills Sanitarium review. Download this game here.